PT Industri Kapal Indonesia (Persero) - PT IKI or known as IKI Shipyard is a reputable state-owned shipyard company in Indonesia. Based in Makassar South East Sulawesi, IKI Shipyard engaged in shipyard industry. Its business include shipbuilding, docking and related industry. 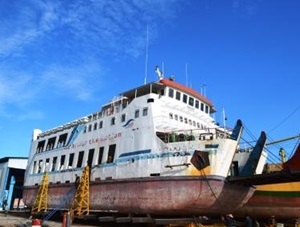 According to IKI Shipyard's company profile as cited by JobsCDC.com, IKI Shipyard was first established as Proyek Galangan Kapal Makassar or Makassar Shipyard Projects in 1963. PT Industri Kapal Indonesia (Persero) officially established in 1977. PT Industri Kapal Indonesia (Persero) is fully-owned by the Governmentof Indonesia. IKI Shipyard now has 2 yard facilities; Makassar Yard and Bitung Yard. The Company also supported by 1 representative office Jakarta and 1 Business and trade units Makassar. Age around 19-35 years old. Minimum education SMA, D1, S1, S2 all majors. Age around 25-37 years old. Minimum education SMK, S1, S2 all majors. Age around 19-37 years old. Minimum education D1, D2, D3 all majors. Minimum education SMA, D1, D2, D3, S1, S2 all majors. JobsCDC.com now available on android device. Download now on Google Play here. Please be aware of recruitment fraud. The entire stage of this selection process is free of charge. PT Industri Kapal Indonesia (Persero) - Admin, Secretary, CS, SPV IKI Shipyard May 2017 will never ask for fees or upfront payments for any purposes during the recruitment process such as transportation and accommodation.